“All you can hear is the dulcet croon of Barry White, and it feels as if your heart is beating itself into a purée. 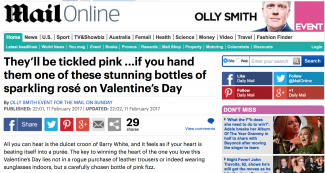 The key to winning the heart of the one you love this Valentine’s Day lies not in a rogue purchase of leather trousers or indeed wearing sunglasses indoors, but a carefully chosen bottle of pink fizz.” Olly Smith, the MailOnline’s wine guru, says it all. With V-Day looming just around the corner, treat the person you love to some Rosé Champagne – but not just any. For more technical information on the best Rosé Champagnes available in the market, head over to our recent Rosé tasting comparison here. Or for quick purchase advice, Olly recommends The Finest Bubble for Bollinger La Grande Anne Rosé 2005, a new vintage release currently on offer at £94.95 a bottle. Or if you want to stay patriotic, you can’t beat Wiston Estate Rosé 2011 for prestige English Sparkling, just £38.45 a bottle. 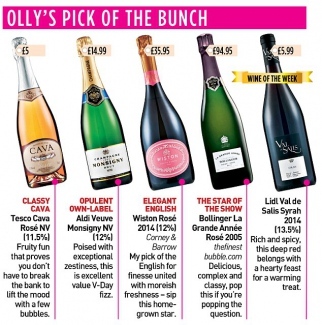 Read Olly’s recommendations in the MailOnline here.